Modern gas boilers are quieter, heat up quicker and use a lot less fuel than their 20 year old predecessors. They are also more reliable and cost less to maintain. Upgrading your central heating with a modern high efficiency gas boiler combined with heat zone control system can halve your fuel bills. Electronic timers that control heating and hot water independently combined with room thermostats, often part of the radiator valve, increase boiler efficiency gains even more. ‘Combination’ boilers deliver hot water on demand and are very economical to run because they don’t use an external hot water tank. The fact they don’t take up much space and you never have to wait for hot water makes them a popular choice, especially in households where it’s not possible to have a storage tank. A system boiler is a boiler containing all the necessary components for the central heating system to work built in to one unit. It has the pump, expansion vessel, safety valve and controls, great for apartments and other buildings where space is at a premium as they are quite compact. A heat only (or open vent) boiler only has a heat exchanger and control unit, all other central heating components, for example, pump, expansion vessel, safety valve are all separate. Watertech offers gas boiler installation, boiler servicing and repairs. 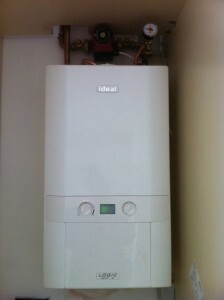 If you require gas boiler replacement or service in the Dublin area, contact us.